Please click here List for the list of names of those who died while in active service during World War one. 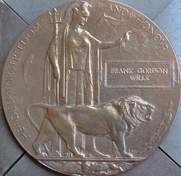 Lance Corporal Frank Gordon Wills aged 31 of 35 Ravenscroft Road, Beckenham served with the First Battalion Bedfordshire Regiment and was killed in action at Flanders on 30th September 1918. Frank was one of the many Beckenham residents who answered the call to serve their country in the battle fields of France. He was the 4th son of Mr and Mrs James Wills of 4 Moreland Road, and an old scholar of Alexandra School and Holy Trinity Sunday School. He left a widow Ellen Wills and a small child Joan, of just 18 months. Frank had sent his daughter a Christmas card with a note saying how much he missed her and requested that she be a good little girl and hoped to see her soon. As the next of kin, a grateful British Government sent his parents a Memorial Death Plaque commonly called the 'Dead Man's Penny' by the troops. 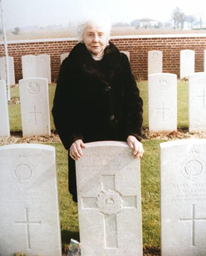 Frank is buried in a war grave at Grevillers British Cemetery. The history of the Dead Man's Penny began in 1916 with the realisation by the British Government that some form of an official token of gratitude should be given to the fallen service men and women's bereaved next of kin. The enormous casualty figures not anticipated at the start of WWI back in 1914 prompted this gesture of recognition. In 1917, the government announced a competition to design a suitable plaque with a prize of 250 pounds. There were 800 entries from all over the Empire, the Dominions, and even from the troops on the Western Front. Mr E. Carter Preston of Liverpool, England, was the eventual winner. In 1999 Joan (left) visited her fathers grave, this was the one and only time that she did. Sadly she passed away 2 years later. The selected design was a 12-centimetre disk cast in bronze gunmetal, which incorporated the following; an image of Britannia and a lion, two dolphins representing Britain's sea power and the emblem of Imperial Germany's eagle being torn to pieces by another lion. Britannia is holding an oak spray with leaves and acorns. Beneath this was a rectangular tablet where the deceased individual's name was cast into the plaque. No rank was given as it was intended to show equality in their sacrifice. On the outer edge of the disk, the words, 'He died for freedom and honour'.
" He whom this scroll commemorates was numbered among those who, at the call of King and Country, left all that was dear to them, endured hardness, faced danger, and finally passed out of sight of men by the path of duty and self-sacrifice, giving up their own lives that others may live in freedom. Let those who come after see to it that his name be not forgotten." Beneath this passage, written in the same style, was the name, and rank and service details of the deceased. 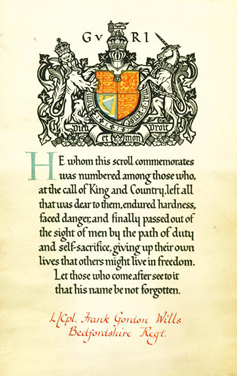 To accompany the scroll, again in old English script, a personal message from King George V.
"I join with my grateful people in sending you this memorial of a brave life given for others in the Great War. "......George R I. The plaques were packaged in stiff cardboard wrapping folded like an envelope and sent to the next of kin. Production of the plaques and scrolls, which was supposed to be financed by German reparation money, began in 1919 with approximately 1,150,000 issued. They commemorated those who fell between 4 August 1914 and 10 January 1920 for home, Western Europe and the Dominions whilst the final date for the other theatres of war or for those died of attributable causes was 30 April 1920. Unfortunately, the production and delivery of the plaques was not a complete success and the scheme ended before all the families or next of kin of the deceased received the official recognition they should have. There were some relatives who returned the pennies to the Government in protest as they felt it was insulting and it did not replace their loved one's life. Of course, nothing can replace a life lost, but for those 'Dead Man's Pennies' that are in private or public collections, museums and national archives, they are a constant reminder of the ultimate price paid by the men and women of the armed services during the Great war of 1914-1918. These pages are dedicated to 711 of Beckenham's finest who left these shores never to return. Their names are remembered on "The Memorial" that stands sentry in the heart of town. Thank you very much for making this site available. It allows me to think in more depth about my relatives and ancestors and to read about their lives and see photographs of where they lived. My mother told me that she was born in Beckenham and I have recently been researching my past. 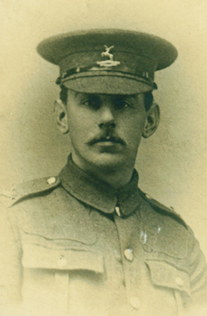 I already knew my grandmother's dear brother was killed in the First World War, and to actually see the name of Henry Thomas Drake on the memorial was a truly touching experience.The very strange coincidence is that my son now lives in Crystal Palace so when I visit him I can take time out to really look around the area as he is so near.